Since 2007, AMC Entertainment (AMC) and the Autism Society have teamed up to bring families affected by autism and other special needs “Sensory Friendly Films” every month – a wonderful opportunity to enjoy fun new films in a safe and accepting environment. 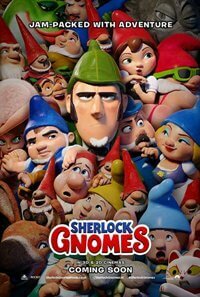 Tomorrow, Sherlock Gnomes is Sensory Friendly at AMC. The movie auditoriums will have their lights turned up and the sound turned down. Families will be able to bring in snacks to match their child’s dietary needs (i.e. gluten-free, casein-free, etc. ), there are no advertisements or previews before the movie and it’s totally acceptable to get up and dance, walk, shout, talk to each other…and even sing – in other words, AMC’s “Silence is Golden®” policy will not be enforced during movie screenings unless the safety of the audience is questioned. Families affected by autism or other special needs can view a sensory friendly screening of Sherlock Gnomes on Saturday, April 14th at 10am (local time). Tickets are typically $4 to $6 depending on the location. To find a theatre near you, here is a list of AMC theatres nationwide participating in this fabulous program (note: to access full list, please scroll to the bottom of the page). Editor’s note: Although Peter Rabbit has been chosen by the AMC and the Autism Society as this month’s Sensory Friendly Film, we do want parents to know that it is rated PG by the Motion Picture Association of America for some rude and suggestive humor. As always, please check the IMDB Parents Guide for a more detailed description of this film to determine if it is right for you and your family.